The Indonesian airline group Sriwijaya is planning further expansion in 2016, with a focus on regional growth using its Nam Air subsidiary. Sriwijaya will take several additional Boeing 737-800s in 2016 enabling it to transfer smaller 737-500s to Nam which will be used to open new secondary bases and compete against the expanding regional operations of Garuda and Lion. Privately owned Sriwijaya has emerged as Indonesia’s third largest airline group, well behind Garuda and Lion but ahead of AirAsia. Surviving an extended period of consolidation and challenging market conditions has strengthened Sriwijaya, leading to a brighter outlook. Sriwijaya has been profitable for the last two years and is confident that it can stay in the black and maintain its current position in the market. However, it will always face the risk of being squeezed out by Garuda and Lion. Sriwijaya is Indonesia’s third main airline group behind much larger Garuda and Lion. The Sriwijaya Air Group currently operates an all-737 fleet consisting of 42 aircraft, including 37 aircraft at the main Sriwijaya Air brand and five aircraft at its regional subsidiary Nam Air. The group carried approximately 9 million passengers in 2015, across a predominately domestic network of more than 40 destinations. Passenger traffic was up 7% compared with 2014, and has doubled since 2008. The group expects its traffic to grow by approximately 10% in 2016, potentially enabling it to reach the 10 million passenger milestone. Sriwijaya is poised to become in 2016 – or in 2017 at the latest – the tenth airline group in Southeast Asia with at least 10 million annual passengers. Sriwijaya corporate planning and business development director, Jefferson Jauwena, told CAPA’s Airline and Fleet Finance Summit on 4-Mar-2016 that the group plans to take delivery of at least 12 aircraft in 2016. In the first two months of 2016 it has already taken two 737-800s, giving it 14 of the type, and phased out its last four 737-400s. The group still operates other 737 Classic models, including nine 737-300s and 17 737-500s. The 737-500 fleet is split between the two brands with five aircraft currently at Nam Air and 12 at Sriwijaya Air. Sriwijaya also operates two 737-900ERs, delivered in Aug-2015, which were the first new aircraft the group had taken in its 13-year history. Sriwijaya has an option to acquire two more new 737-900ERs in 2016, which it will exercise if it can arrange financing for the aircraft. Sriwijaya forged a sale and leaseback transaction with Aergo in 2015 to cover its first two 737-900ERs, and is talking to leasing companies about a similar arrangement for the two additional 737-900ERs. However the group is focusing mainly on expanding its fleet by leasing additional used 737-800s and may not end up taking additional 737-900ERs. Mr Jefferson told CAPA on the sidelines of the summit that Sriwijaya could end up adding 13 used 737-800s in 2016, including the two aircraft that have already been delivered. The group is now talking to several leasing companies and has so far only committed to four additional 737-800s for 2016. Sriwijaya took its first batch of four 737-800s in 2012. After a more than two year hiatus in fleet renewal Sriwijaya took two more 737-800s in 2014 and six 737-800s in 2015. Its current fleet of 14 737-800s, including the two delivered in early 2016, are between seven and 17 years old, according to the CAPA Fleet Database. Its 737-300s are 15 to 27 years old while all of its 737-500s were manufactured in 1994 or 1995, making them approximately 21 years old. The average age of the group’s fleet is currently almost 19 years old. Sriwijaya aims to reduce the age of its fleet, but it prefers to stick with mainly acquiring second-hand aircraft. Sriwjaya is considering potentially selling two 737-300s in 2016 but it plans to keep at least five 737-300s in its fleet to meet Indonesian regulations, which require all airlines to have at least five owned aircraft. Sriwijaya also has no intention of starting to phase out its 737-500s, most of which are leased. At least for now, the group plans to keep its 737-500 fleet for another five to 10 years. As Sriwijaya takes delivery of more 737-800s the group plans to transfer 737-500s from the main brand to Nam Air. Mr Jefferson said that Sriwijaya Air plans to transfer five 737-500s to Nam by Jun-2016, doubling the Nam fleet from the current five to 10 aircraft. Nam launched in late 2013 but has since been slow to expand its fleet. During the pre-launch phase the group considered several potential business models for Nam but ultimately settled on a regional full service model. Nam serves regional routes that are generally not already served by Sriwijaya and is used to feed Sriwijaya’s domestic trunk routes, as well as catering to point-to-point passengers seeking to avoid a connection in congested Jakarta. Mr Jefferson told CAPA that as Nam expands in 2016 it will target regional routes now served by the Garuda and Lion groups with regional aircraft. Both Garuda and Lion regional subsidiary Wings Air operate ATR 72 turboprops and Garuda also has a new fleet of Bombardier CRJ1000 regional jets. In 2014 and 2015 the group considered acquiring turboprops for Nam and evaluated the ATR 72 and Bombardier Dash 8-Q400. 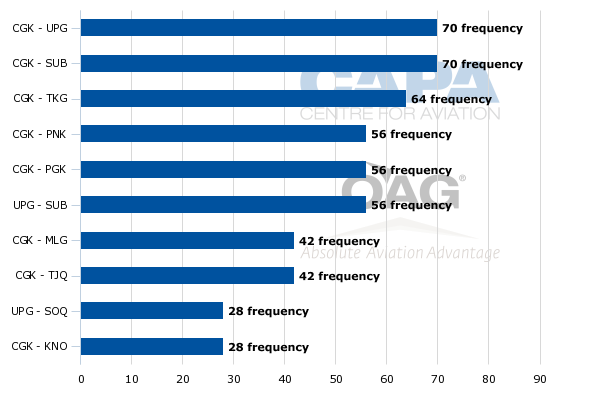 CAPA reported in its last analysis of the Sriwijaya Group, published in Mar-2015, that the group was planning to acquire 20 to 30 turboprops, with deliveries beginning as early as late 2015. Mr Jefferson told the Summit that after assessing turboprops for two years the group determined that it was best to “maximise” its 737-500 fleet. As the smallest member of the 737 family, the 737-500 can access several airports in Indonesia that are unable to accommodate 737-800s or A320s. Sriwijaya believes that passengers travelling to these airports, if provided a jet option, will chose the 737-500 over the turboprop product of a competitor. The expansion of Nam will enable Sriwijaya to enter regional markets now only served with turboprops by Garuda, Wings and in some cases small independent Indonesian regional operators. Nam also intends to use its expanding 737-500 fleet to open point-to-point routes that are too long for turboprops but too small for 737-800s. 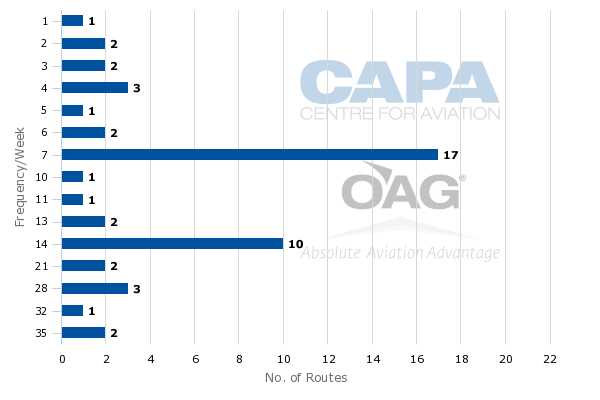 In some cases these routes are entirely unserved, and in some cases they are served by Garuda with CRJ1000s. Nam currently bases its 737-500s at Pontianak, Jakarta and Surabaya. Jakarta and Surabaya are on the main island of Java, while Pontianak is on the island of Borneo in central Indonesia. As it more than doubles its fleet in 2016 Nam is considering opening bases at Medan on the western island of Sumatra, and at least one airport in eastern Indonesia. The new bases will enable Sriwijaya Group to improve connectivity on regional routes in the west and eastern parts of Indonesia, a nation that stretches approximately 5,000km from east to west. East Indonesia is more remote but is growing more rapidly than other parts of the country, attracting new services from all of the main Indonesian airline groups and some smaller regional carriers. Sriwijaya Air has its main bases at Jakarta and Surabaya, Indonesia’s two largest cities, and a third base in Makassar in central Indonesia. Several Indonesian airlines use Makassar for connections to central and east Indonesia. 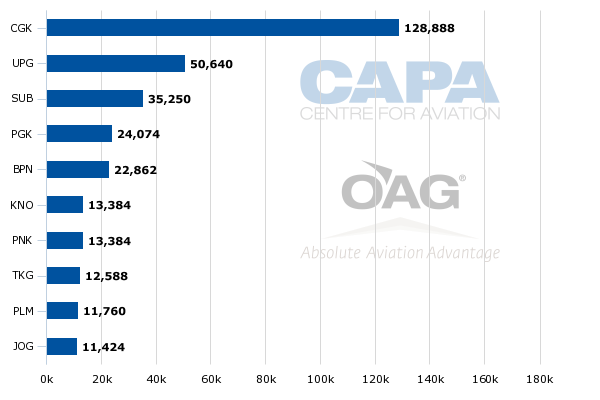 The Sriwijaya Air Group currently allocates approximately 55% of its total seat capacity to Jakarta Soekarno-Hatta (CKG), according to CAPA and OAG data. Makassar (UPG) is the group’s second largest hub followed by Surabaya (SUB). There are limited opportunities to add flights at Jakarta and Surabaya due to current infrastructure constraints. However, airlines are able to add capacity by upgauging existing flights, resulting in a more efficient use of slots. Sriwijaya Air has already added capacity on some trunk routes by deploying its two new 737-900ERs, which are in 220-seat single class configuration. For example, Sriwijaya is now using the 737-900ER for some flights between Jakarta and Makassar, which along with Jakarta-Surabaya is its biggest route with five daily flights. Sriwijaya currently has six routes with at least four daily flights, including five routes from Jakarta. The only non-Jakarta route with at least four daily flights connects the Surabaya and Makassar bases. Nam only has one route with at least four daily flights (based on OAG data for the week commencing 7-Mar-2016). 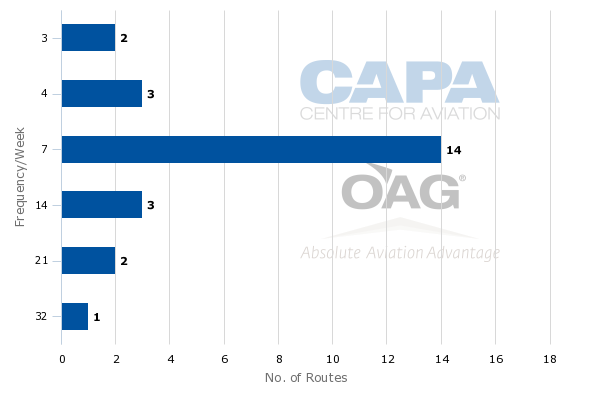 Nam also has shorter routes on average, reflecting its regional role. Sriwijaya will have the opportunity to upgauge a large proportion of its flights in 2016 as it replaces the 737-500s being transferred to Nam with larger 737-800s. All of the group’s 737-800s are now in 189-seat single class configuration while the 737-500s are in 120-seat two class configuration, resulting in a nearly 60% increase in capacity for any flight that is upgauged from the 737-500 to the 737-800. Flights upgauged from the 737-800 to 737-900ER generate a more modest 16% increase in seat capacity. The 737-500s are the only aircraft in the fleet in two class configuration but the business class seats are not currently being sold. Instead the eight seats at the front of the aircraft (two rows of four abreast) are assigned to full fare economy class passengers and VIPs. These passengers are provided the same on-board service as the passengers in the normal six seat abreast economy rows. Sriwijaya experimented with offering a business class product from 2012 through 2014. The product was available on some 737-500 and 737-800 flights but the take-up was low. Garuda and the Lion Group full service subsidiary Batik Air are currently the only Indonesian airlines now selling a business class product in the domestic market. Sriwijaya and Nam are both categorised as a medium service airline under Indonesia’s DGAC. Garuda and Batik Air are in the full service category while Lion Air, Wings Air, Indonesia AirAsia and Garuda budget subsidiary Wings Air are in the no-frills category. The categories are used by the DGAC to determine fare floors and caps for every domestic route. Sriwijaya has grown steadily since launching in 2003 and is by far the largest airline in the medium service category. It has survived multiple waves of consolidation, emerging as the only major player after Garuda and Lion – both of which also now have multi-brand models. Four airlines suspended operations in the last wave of consolidation in 2013 and 2014, including Batavia, which was roughly the same size as Sriwijaya and had a similar full service middle market business model. The number of passengers carried by medium service airlines has dropped significantly since 2012, but Sriwijaya still firmly believes there is role for an airline in the middle segment. Sriwijaya has been profitable the last two years despite challenging market conditions and is confident it will remain in the black in 2016. The group is now focusing on further improving its financial position by reducing its costs, while growing ancillaries. Sriwijaya – like most Indonesian airlines – has not traditionally embraced ancillaries but has launched a new ancillary program projected to generate USD7 million in additional revenues in 2016. Growth is also an important component of the Sriwijaya strategy as the group tries to maintain its relevance in a market increasingly dominated by the Garuda and Lion groups. “If we don’t grow we will die,” Mr Jefferson said. The group will continue to focus mainly on domestic growth, particularly in Indonesia’s fast-expanding regional sector. However Sriwijaya is also looking to expand internationally, with new scheduled flights to Australia and an expanded charter operation to China. Sriwijaya’s survival and recent success has proven that there is still room for a third major player in Indonesia’s dynamic market. The group’s current strategy of focusing growth on regional feeder and new point-to-point routes, which are less competitive and faster-growing than trunk routes, is sensible. Sriwijaya over the years has made several strategic U-Turns and struggled to settle on a business model. The group now needs to implement its current business plan, avoiding any more major strategic changes while being nimble enough to respond to opportunities. Competing against Garuda and Lion will never be easy, but Indonesia is a big enough market to support a third competitor over the long run.